Copper prices are down 3 cents following easing prices on the London Metal Exchange as global markets reflected tempered demand from China. NEW YORK (TheStreet) -- Copper prices are down marginally following easing prices on the London Metal Exchange as global markets reflected tempered demand from China. The July benchmark is currently trading down 3 cents at $4.02 on the Comex in New York. The three-month benchmark for copper on the London Metal Exchange closed down 0.2% at $4.09 per pound last trading session. The August copper benchmark on the Shanghai Futures Exchange last closed down 0.6%. A monthly update on industrial production, due out on Wednesday, is expected to shed light on how factories, mines and utilities are doing. Overall growth was flat in April, largely due to a slowdown in auto manufacturing in Japan. However, mining production saw a 0.8% increase in April. Industrial production data, along with manufacturing and unemployment statistics are amongst the biggest factors influencing the metals market. The markets are likely to watch Chinese economic data once again this week as the country plans to release readings on consumer and producer prices Tuesday. Economists are predicting that a rise in Chinese imports and continued strength in construction as the year progresses will help boost copper's upside in the longer term. 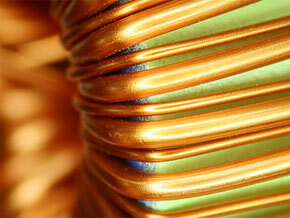 Last Friday's copper prices settled at a two-week low, mainly on weak import-export data from China. The country reported last week that its imports for May dropped 36% from the same month a year earlier. Copper mining company Kazakhmys is set to increase copper supplies to China, according to a Reuters report. Kazakhmys, with operations in Kazakhstan, just signed a $1.5 billion loan agreement with China Development Bank, owned by the Chinese government. The agreement will allow China to tap into the development of one of Kazakhmys most promising copper deposits. China previously loaned $2.7 billion to Kazakhmys to develop another one of its major copper fields in 2009. Kazakhmys shares are currently trading up 3.4% at 1253 pounds per share on the London Stock Exchange. Production at Chilean mining company Codelco is still short of capacity after worker protests over wages last Friday, said Reuters. Codelco, which owns El Teniente, the world's fifth-largest copper mine, produces about 400,000 tons of copper a year and has reportedly lost 7,000 tons of production so far due to labor disruptions. The strike has escalated fears of a longer term disruption in copper supply from the world's number one copper producer. The dollar index, often inversely related to copper prices, is down 0.25% at $74.65 compared to a basket of currencies this morning. Copper mining stocks were generally up or flat this morning. Mining company Southern Copper ( PCU is up 0.3% at $31.59. Freeport-McMoRan Copper & Gold ( FCX - Get Report) is up 0.47% at $49.17.